[b] MEETING NOTES: Please note that at 1:00PM we lunch first (usually group yum cha). If you don't want to do this, stay at the meeting point and sketch, or come back around 2:00PM. [b]DISCLAIMER:[/b] The creator of this thread, Roberto Ortiz, CgNetworks And CGTALK is not responsible on what happen on these meetings. The persons are meeting under their own accord and their actions are their own. The parties mentioned before are not responsible in no way shape or form for their actions and thus are not liable. awsome idea, at the moment im a tad bogged down with work, but i should be able to hopefully make it. I shall be there, provided it doesn’t happen the weekend after this one Got some school commitments to attend to. But yes, shall be extremely beneficial for my VCE Art/Studio Art subbies, mm. Updated time and meeting location! I’m going to be there if I can, regardless if people come or not! i should be able to make it. hopefully. sadly, i cant make it tomrrow, i finish my course in 2 weeks and i cant afford any time away from the pc at the moment trying to get work done / finished for the final submission, so im sorry i cant make it! Just so you know, I will be there tomorrow. I’ll be wearing a green jacket with a turned up collar, and most likely carrying a balck sketchbook! i will wait out the front of the gallery until 1:15pm, at which point I will enter and start the sketching. This is obviously a trial run, so feel free to discuss what will work better for you. 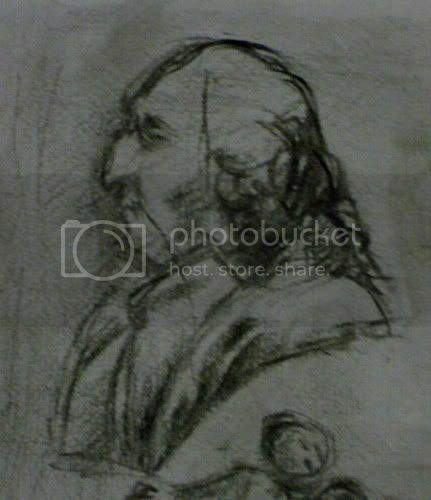 I would still like to do do a large amount of sessions on public transport, to keep in the spirit of the Bobby Chiu idea, but for this session I thought a little study of the masters wouldn’t go astray. Good luck Martin et al. I’m going to thoroughly enjoy the results of this, the inaugural Melbourne Subway Sketch Group. I can’t be there, but I’ll be subscribing to this thread so I can make it along to a future one. Well, here’s the fruit of the first ever Melbourne Subway sketchbook… which didn’t actually get anywhere near a subway, but it was a group of sorts, so that will have to do. Thanks to Min and Natasha for being there, it was great to meet with you! More coffee experimentation! We started at the gallery, but made our way to a cafe later where there were more people. 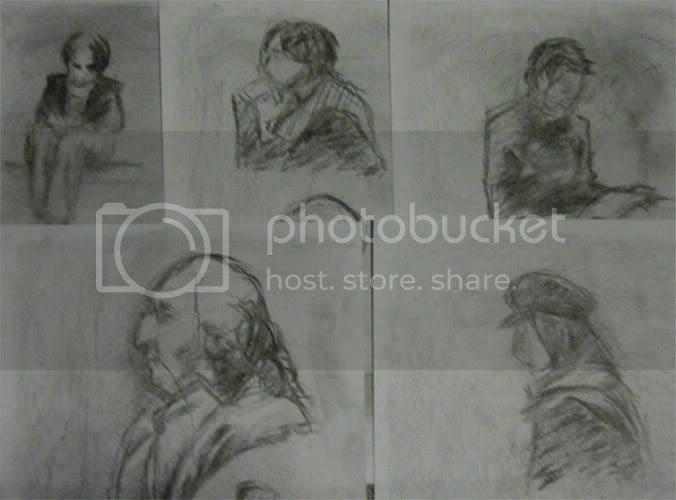 Martin, I like those pictures you drew from the cafe~ And the master copies look really good So many sketches of people huddled up against Melbourne weather. I have failed with le espresso, and I need a bigger sketchbook Nowhere near fast enough/skilled enough to draw people’s faces A lot more challenging than lifedrawing. Sketch of a bust from the gallery, which is also kinda rough. This was very, very fun, except I had insomnia later from ingesting too much caffeine, but I will avoid that in the future. I personally think you did a bang-up job of sketching Natasha! You’ve obviously had good training. (Your quick sketches are far more solid and confident than mine!). Hope to see you again! On that note, I’ll try and set up another for two weeks time, most likely at a platform, or an open cafe area. Any suggestions are most welcome, but we should probably stick to the city, as it’s the most central location. hey great job the both of you! great to see the sketches!! I’m in on the next one. Date, time and place and I’ll be there. Is the 7th of May mothers day? If so, I may have to change it! erilaz & lanternkid, awsome! it was so nice meeting you guys. though it wasn’t all that productive we had fun, except for the weather… I still have no idea how weather goes in Melbourne, it’s so hectic! hehe. 7th may is kinda weird for me coz I will be back in Sydney… eeek, that weekend I won’t be able to make it. lanternkid, hehe, bigger sketchbook! and no short blacks! Me and my friend Andrew might go, depending on how much homework we have. I’ll let you know closer to the date.